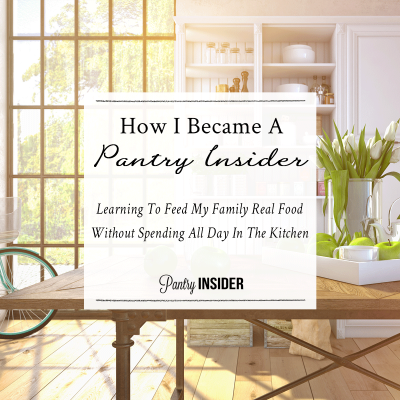 I was talking to another mom the other day who said, “When I was a young Mom I would have loved to stock my pantry with whole foods, but just the cost of the of the jars alone would have sent me to the poor house.” I understand how she felt. Brand new, I can usually pay $8 for a dozen canning jars (scroll down to see where I get them at that price! ), which makes them about 67 cents each. But you can’t buy just one. 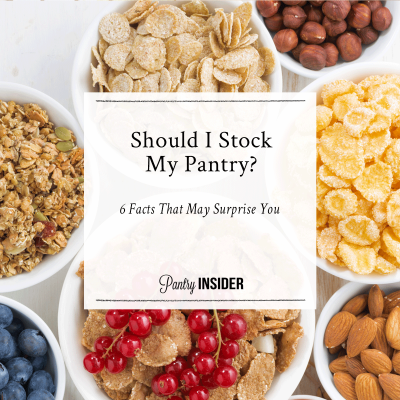 Usually, a fully stocked pantry uses at least a few hundred jars. 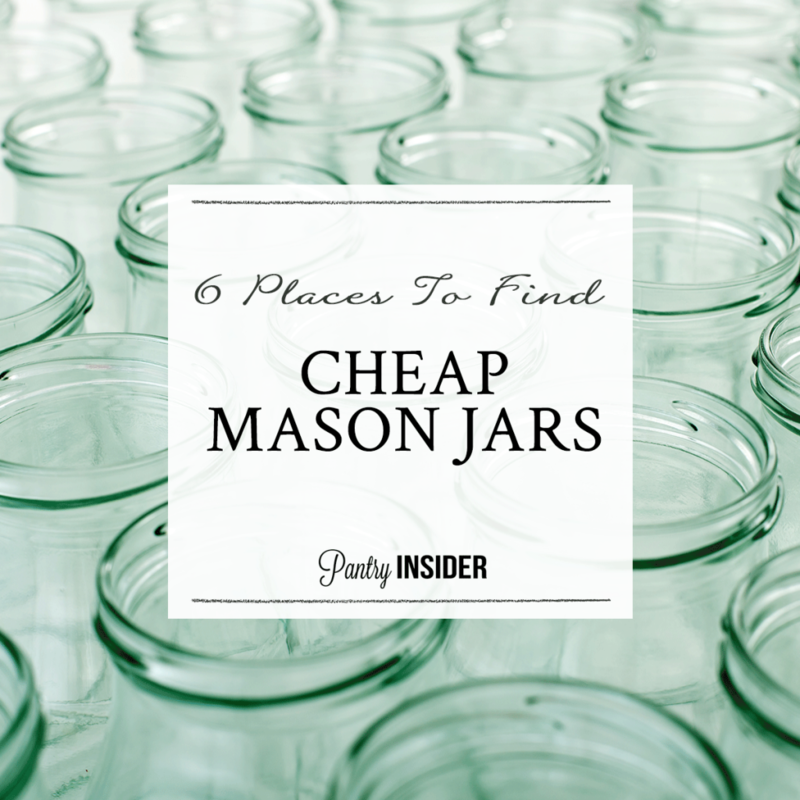 That cost can add up pretty quickly so it’s good to know where to buy cheap mason jars. Husband: Wow, we sure have a lot of mason jars. There must be at least 1,000 jars here. How about we give some away? Me: **gasp! ** I’d rather give YOU away. Him: Oh…. Don’t you think that’s a little extreme? Me: NO. And if you ever bring this up again, I will never feed you homemade spaghetti sauce again. NOT EVER. 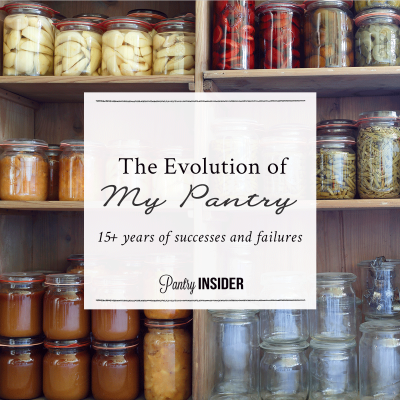 The Dollar store – If I am in a hurry… If I have produce sitting in my kitchen and I need jars to can it right away so it won’t spoil – I will buy canning jars at our local dollar store. This is where I can get them for $8/dozen, which comes out to 67 cents each. Not a bad price, at all. The jars I buy there are a brand called Golden Harvest. They’re not as expensive as some of the other brands, but I’ve never had a problem with them. So far, they have served me well. Craigslist – Maybe I’m a little obsessed but I do a Craigslist search every week or two, just checking to see if anyone in my area is selling canning jars. 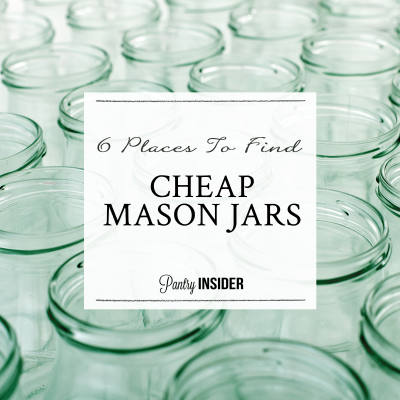 I use search terms like “mason jars,” “canning jars,” “craft jars” and “wedding decorations” and then check the brand of the jar on the listing. Often, on our local Craigslist, people are selling used jars for the same price as brand new jars, but sometimes you can find a really great deal. Freecycle – From time to time, people clean out their attic and garages and find boxes of mason jars that haven’t been used in a long time and list them on Freecycle. Freecycle.org is a site where you can sign up for a list that is local to you and then you can pick up other people’s discarded items for free. 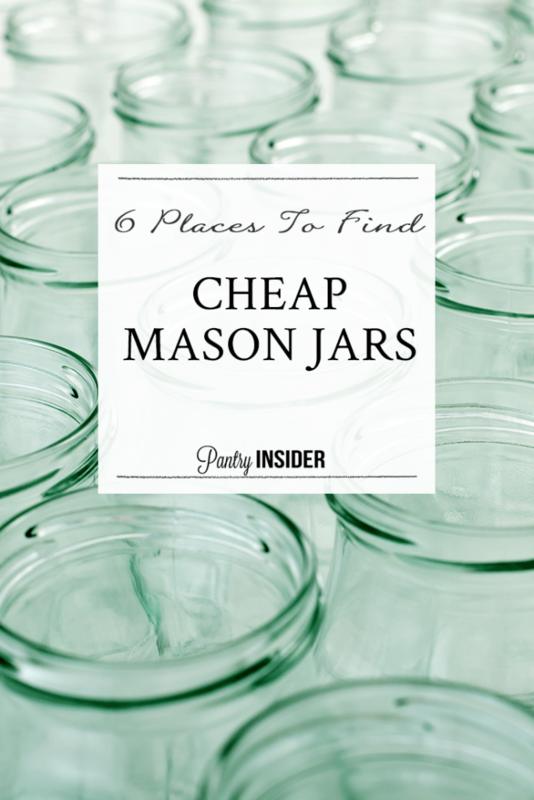 In the spring and early summer, I have found that lots of people get on Freecycle and post “In search of Mason Jars!” I think the likelihood of being gifted mason jars during those times of year is probably low. But during the off season someone just might respond to a post like that. A good rule of thumb is to not post for the same item very often and to make sure you post something you are willing to give to the community at least as often as you post something you are looking for. Garage Sales- People are trying to clear out the things that they don’t use anymore. I often see mason jars at garage sales and it’s pretty easy to negotiate and score a great deal! Estate Sales – Estate Sales are generally like a garage sale, except they are selling everything they own. Often estate sales happen when both grandparents have passed away and the family is disposing of their physical belongings. 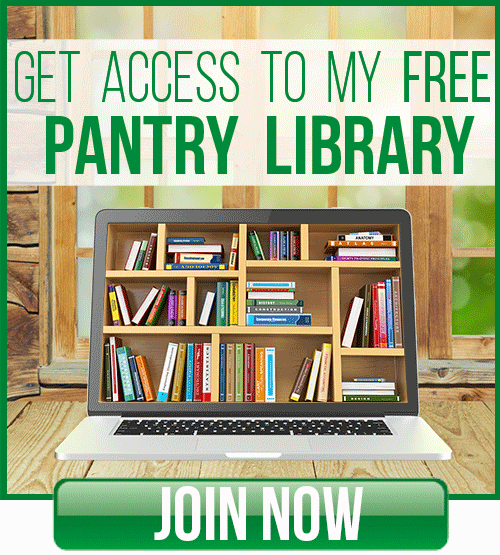 I have gotten amazing deals on canning jars at estate sales! Usually there are several boxes of Grandma’s jars and they’ll take a certain amount of money if you will agree to take all the jars. Be sure to inspect the jars to make sure they are actual canning jars, because sometimes relatives will not know the difference between various types of jars and will tell you “those are Grandma’s canning jars” when in fact they are a collection of other kinds of jars. But if you due your due diligence, you can get an amazing deal on jars at estate sales. Also, look around at estate sales for other canning items. If Grandma had jars, she probably had a good canner and tools to help her can more efficiently. 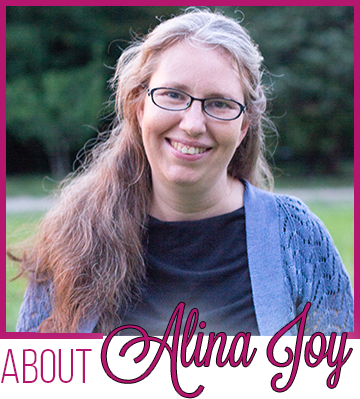 I once bought a $400 pressure canner for $50 at an estate sale (and it came with “free” jars). I never met that woman, but I think of her every time I pull my pressure canner out. 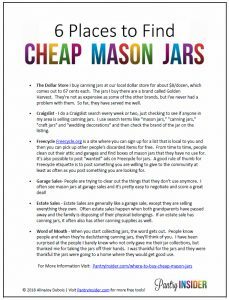 Word of Mouth – When you start collecting jars – especially if you start giving your canned food away to people as gifts – the word gets out. People know people and when they’re decluttering canning jars, they’ll think of you. I have been surprised at the people I barely knew who not only gave me their jar collections, but thanked me for taking the jars off their hands.I’ve also bartered with people who are no longer using their jars. A Canning Jar is a hot commodity for food storage, but it’s just clutter for somebody who doesn’t use them. If you have something that appeals to them (maybe something for their new hobby, or an edible gift from your pantry) people are happy to trade the jars they are no longer using for something they want! I once traded a Lilla Rose Flexi Clip for 4 dozen canning jars with a young lady who was no longer canning, but had beautiful long hair. We both walked away from that deal feeling like we had gotten the better end. IMPORTANT NOTE: If you purchase used jars, it’s important to buy new lids for the jars. On Craigslist, you never know for sure if a lid has been used. If it has been used, it may not seal properly. Consuming food from an improperly sealed jar can lead to illness and even death. It’s just not worth the risk. Don’t Miss Your Free Printable!